Goodness… It’s been 8 months since I last updated this. Quite a lot has changed during this time. I’ve got a new job, which is absolutely fantastic. My daily commute of 70 miles takes much less time than my previous commute of 35 miles. Odd really. I’ve only done about 40 miles on my bike so far this year, which is absolutely pathetic. I competed in Hit The North again, in February. OK, I turned up and pootled around, but… I didn’t die/fall off/break anything for a change. Hopefully the summer 6/8hr race will be back on this year and i’ll aim to do better with that one. My plan to get out riding this week failed when I managed to snap the gear hanger off the back of my bike after refitting the whole of the chainset. No riding this weekend either, so that means I’ll miss Over t’Edge. I’ve got some new tyres for the bike, which I’m itching to test out. 2.2″ dual compound Kenda Karma Kevlar. They’re 670g each, which is quite a bit lighter than my previous Michelin tyres so it’ll be interesting to see if I notice any difference. I have to say that the lack of cycling really has impacted on my energy levels, which are through the floor at the moment. Which, thanks to my employer’s cycletowork scheme could be highly attractive. The ScandAL is favourite at the moment as i’ve got a bit of a thing about 29ers, but the thought of having a carbon bike is very enticing too. I arrived at around 9.30 and signed on, got my shiny number 41 to attach to my ‘non carrying’ arm. One arm to carry my bike, yeah right! and my timing chip which had to be swiped at the end of each lap. Unfortunately, the weather was exactly as the BBC Weather predicted- Light Rain, followed by heavy rail, followed by more heavy rain followed by sunshine. The sunshine did arrive a couple of hours earlier than planned which did help to dry the course out as it was slippery as hell in places. After the briefing and more rain it transpired that we had to run for a couple of hundred yards to where the bikes had been stacked up against the barriers and an overseer from British Cycling would keep an eye out to make sure that no-one got on their bikes until the end of the barriers. This was to reduce any risk of ensuing chaos with people all trying to get on bikes at the same time. Anyway, I don’t do running and neither did a few other riders, so we had a nice leisurely walk to where the bikes were stacked and got on and started riding. The course was a mixture of grassy tracks, some roads and quite a bit of recently made bermy type sections made from compacted gravel, oh and a couple of nice rocky bits to ride over too. Right from the start the grassy bits had become very slippery muddy bits and my tyres didn’t like it at all – If my tyres didn’t like it then neither did I! I took it very easy on the first lap as I didn’t want to crash/die. The muddy sections then turned into a nice tarmac section (I think), but then there was a really horrible bit where you had to carry/push your bike up a really steep embankment approx 50m long followed by an equally steep descent back on to the track that we’d been cycling along. After that there was some compacted gravel followed by a climb up some slippy cobbles that led onto a really swoopy/bermy switch back section that headed out towards a crossing over the M60. By this point my right knee was giving me serious gip and my front mech had decided not to play ball thanks to copious amounts of mud that had manked up its workings. At this point we were riding near Phillips Park on the land near the Pilkingtons factory and using the newly installed rock beds and sweeping bermed sections. Another crossing took us back over the M60 to another really slippy climb, again on cobbles, that then brought us eventually out onto a short road section before turning off and dropping down a gravel track, along a flat concrete road and then a long section of sweeping gravel track. A steep drop brought the course down onto what looked like a disused railway line and the final part of the lap; a quick drop with a climb over some exposed tree roots and then a choice of a steep descent down to a stream or a chicken run that was less steep. I opted for the chicken run, then carried the bike over the brook and pushed/carried/dragged my bike up the other side to complete the lap. Lap two didn’t start too well. I should have changed over to my narrower tyres before the start but didn’t so I’ve only got myself to blame. The first descent was really cut up and muddy, but it was really fast too. So I tried a little too hard and the front wheel jack-knifed on the mud and pitched me in to the ferns that lined the route. That I have to say was the only off of the whole day and I carried on for an uneventful lap, being passed on a regular basis by the quick guys. Lap 3 I managed to find a perfect spot to be lapped – A bed of nettles, so managed to sting my legs and arms, but at least I did get a thanks as I was passed. Start of Lap 4 I decided to stop and get some lunch as I was starting to tire. Stupidly, I’d not brought enough money with me, so I had to drive to the ASDA in Radcliffe to get something to eat. Got back to the campsite at Ringley and quickly wolfed down a pasta salad and two packets of hula hoops. I swapped my tyres over to slightly narrower ones and managed to pinch flat my front tube. Fortunately I had brought some leeches with me and they fixed the leak without any further drama. Lap 4 was fine, but the pasta salad repeated all the way round the lap and my legs were really really starting to hurt. On lap 5 my front mech decided that it would work fully and I could select the bottom ring, but by this point it was too late and i’d used up all the strength my legs had to offer. What I did do though on the final lap was I made sure that I rode the rock section down to the river and also rode the final steep drop (which wasn’t that steep after all) and finished the race. BLOODY HARD WORK, but so so fantastic! I think i’d have only improved 2 places if I’d spent an hour less lunching! Ok, this weekend I’ve got the Manchester to Blackpool bike ride. It covers 63 miles, which is a huge distance for me. The furthest I’ve ridden is 28 miles for over the edge. This had a lot of climbing in it and I felt my legs starting to give up 5 miles from the end of the ride. So, what should I eat beforehand to ensure I’m suitably fuelled for the ride? Lots if pasta the night before? Is this all I need or do I need to start this a few days earlier? 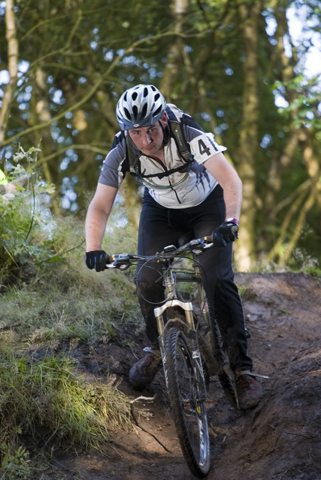 Later next month I’ve got an 8hr mtb endurance event and I could do with some advice for that too? I won’t be racing off and trying to beat people on pace; I hope to finish mid to bottom table thanks to a slow and steady pace. Does the type of food differ for this or is it still loads of carbs? About 18 months ago I half heartedly entered a Manchester bike race called Hit The North 1.5, which was dubbed a winter sprinter. 2 hrs + 1 lap was the format and I think it cost a tad over a tenner to enter. I’d got a relatively new bike at the time and thought I’d be able to hack 3 or 4 laps of the course around Philips Park. In all honesty I expected the race to be on a fairly flat park course and didn’t expect there to be as much climbing, descending or singletrack sections. Race day arrived and the race began, I overtook a few riders on the first lap, so far so good. Broke my helmet, cut my chin and ran out of energy so retired at the end of lap 2. What has this got to do with now? And I’m both very excited and truly terrified! This isn’t a 2hr race, but an 8 hour endurance (for me) event in a similar area to the race I crashed and burned. My bike is better – gears, forks, brakes and pedals have all been replaced/upgraded. I’m much much fitter – 6 months ago I could just about manage a 5 mile ride in an hour. Now I can ride 20-30 miles at an average of 10-12mph. Technically I’ve improved; I can pick better lines, maintain my balance better and thanks to extra strength I can use my gears more efficiently. Risks? I’m doing the Manchester to Blackpool ride 13 days before, which is 63 road miles and significantly longer than any ride I’ve ever done, so I might be a bit broken. I’ve not fully beaten my fear of descents. A trip to Cragg Quarry and yesterday’s step riding has improved things but I’m not confident on slippery surfaces. How will I do and have I got a strategy? 5 or so laps. Probably split into 2×2 lap stints with a rest inbetween. If the legs hold up and I don’t break either the bike or me, then I’ll aim for another 2 laps. It’ll be way off the winner, but I don’t care. I want to do my best and if my best is 4,5 or 6 laps then so be it. So with much trepidation I say roll on the 17th July. Well Saturday came and I thought I was prepared enough for the race (yeah right!). Conditions were good, cold and frosty, nice wintry sunshine and no rain. The race started at just after 10AM with around 90 starters. In the first section i’d passed 3 or 4 riders so I was hoping a top 70 finish may be achievable. The first lap was ok, pretty uneventful. I was lapped by the front-runners before the end of the lap but I didn’t mind. Lap 2 started and I was feeling more confident, passing another couple of riders before disaster struck! The steep drop into Mere Clough was to be my undoing – A combination of the wrong tyres, lack of skill and a slippery descent resulted in the front of the bike losing and regaining grip – Just enough to caterpult me over the handlebars! So with a slightly damaged helmet and grazed chin I continued onto the end of the lap before stopping. Final finishing position 88th out of 89. Not quite what I was hoping for but i’ll be more prepared for my next race, whenever that may be. Well I think I have got an entry on HTN 1.5, just waiting confirmation. I’m slightly worried that i’m not fit enough yet to ccompete in races like this, but i’m going to try my damned hardest! My local riding is on the moors above Rochdale, so there are some quite extended climbs, so a lap around a park with a couple of climbs should be OK. I’d like to finish in the top 75 and do 5 laps in the 2 hours. I’ll be doing the preview ride, so i’ll get a good idea of my chances.